Dynamic NC is a manufacturer of complex structural aircraft and engine-mount components. The Wichita-area supplier is highly focused on taking steps to reduce its unit price, because it knows its costs affect everything moving up the aviation supply chain. This is one reason that the company invests heavily in high-performance technology. 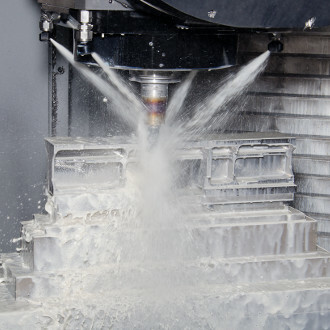 After winning a bid to produce 13-8 stainless steel structural components, it went in search of the best equipment for 5-axis hard-metal machining. It needed technology to achieve greater flexibility in hardened materials, but it also wanted a machine that would extend perishable tool life, improve reliability and reduce labor. Dynamic NC knew that having these types of features would help it lower its per piece costs. The company conducts a lot of research prior to making a machine purchase. It does not compare equipment based on price and specifications, but rather on long-term performance, associated costs and process flexibility. After a successful history with a Makino a92 horizontal machining center and F9 vertical machining center, it again looked to Makino for its most recent hard-metal machining order. Dynamic NC purchased two T1 5-axis horizontal machining centers — the first two of these machines sold in North America. It liked the T1’s rigidity, stability and kinematic structure. Soon after, it also purchased two MAG3.EX 5-axis horizontal machining centers to handle new orders for complex monolithic aluminum aerospace parts. The T1’s rigidity has enabled Dynamic NC to perform hard-metal machining without limitation and with complete accuracy. The company has been able to reduce cycle times by 50 percent, extend tool life by five to six times and reduce machining labor costs by 80 percent. This has enabled Dynamic NC to provide its customers with the lowest achievable part costs in challenging part applications. The machine’s range of motion has reduced setups and labor, and has helped the company achieve additional accuracy in its parts and longer tool life. The MAG3.EX has only been in use at Dynamic NC for a short time, but has already helped lower cycle time, as well as labor and tooling costs—further reducing Dynamic NC’s total cost of operation.